Capacity 196 cc / 12 cub in. The CB200 of 1972-74 was a sporting, high-revving roadster (twin carburetors, 5 speed, front disc) with a top speed in excess of 80 mph and an mph/rpm rate, in sixth gear, of 8V2 per 1,000, which meant that any owner with even the mildest interest in quick travel tended to keep the tacho needle almost permanently in the red, beyond the 9,500 border. Usually finished in what interior furnishers might term lime green, and with a little roll of padded fabric along the top of the narrow tank (a feature peculiar to this model and of doubtful utility), the electric-start CB200 was never a big seller, despite an attractive specification. These little twins were the first models Honda seriously marketed in this country: the C92, CB92, and CA95. The first two-had 124cc engines and the latter displaced 154cc. The CB92's crankshaft was supported by four main bearings and there was an optional racing kit available which helped many amateur racers to the winner's circle. The C92 and CA95, whose crankshaft was unsupported in the center, were more pedestrian versions of Japanese domestic models. The more robust CB92 type engine evolved into the CB and CL160 series in 1965. We ran a 10,000 mile road test on a CB160 in 1968. Most of the reader response to the test was from owners who chastised us for ending the test so soon: one fellow had over 50,000 miles on his. And there are still hoards of 160s humming along the Main Streets of America. A lot of them look as if they haven't been washed since they were bought and many of the original chassis parts have been survived by any number of custom replacements, but they're still running. In 1969 the basic engine grew to 174 cc and the resulting increase in power was more efficiently transmitted through a five-speed gear box. The cylinder and head were changed to the more efficient breathing and better cooling types developed for the 350 series. With the camshaft boxes separated from the head, the engines were shorter and easier to work on. The 175 engine was a worthy successor to the 160. It was just as durable and had a little extra punch. Throughout this whole series of engines, the stroke has remained constant at 41mm. Increases in displacement have come through enlargements in the 44mm bore of the first 125s. This ancestral tie binds the CB200 to the earlier small Honda twins. In fact, very few internal changes differentiate the 200 engine from that of the 175. The bore has grown from 52mm to 55.5 mm and the fifth gear ratio has been raised to .96:1 from 1:1 to allow a higher top speed of 80 mph. Apart from the high gear ratio, the only other change in the transmission system is an omission of the familiar hollow mainshaft and pushrod type clutch engaging mechanism. The new actuator is the kind that has three ball bearings transmitting the thrust from matching ramps and the whole device is mounted in the primary drive cover immediately outboard of the clutch. Along with removing a source of problems with leaking seals and eliminating components which require external lubrication to prevent galling, the new mechanism has the added benefit of a smoother and more positive clutch engagement. New synthetic rubber mounting stubs provide completely live mounts for the 200's dual 18mm Keihin conventional carburetors. Rigidly mounted carburetors often give lean mixtures when a certain engine speed (rpm) matches their natural frequency of vibration. With carefully constructed elastic insulation, this tendency may be "tuned" out as it has been on the CB200. Honda's choice of an 18mm carb on the 200 perpetuates a steady decline away from the performance orientation of the CB160. That model had 22mm instruments; the CB175 carbs were 20mm in effective venturi area; now the CB200 is dished up with 18mm gas/air mixers. The rather predictable end result is that the CB200 is effectively strangled at high revs. Compared to the CB200, the CB160 was a racing bike. And with its four speed gearbox, it had to be. We haven't seen any camshaft timing figures on the 200 as yet, but from the feel of the engine, it's a safe bet that the valve timing is more sedate than on the CB160 and the CB175 as well. Top speed and quarter-mile numbers for our CB200 are almost exactly identical to those of the CB175 tested back in the April '71 issue. It would be very interesting to outfit a CB200 with the carbs from a CB160 and the camshaft and exhaust system from a CB175. As it is, the CB200 is outfitted to be whisper quiet (81 dB(A), Calif. std.) and docile as it provides absolutely reliable transportation on city streets with occasional hum-jaunts down the freeway. The bike will easily sustain 65 mph in high gear if the road doesn't go up any hills and there isn't much headwind. But a hill of more than three degrees or a headwind of 10 mph will require the rider to downshift to fourth gear and run the bike at wide open throttle to hold 60 mph. On the slightest downhill run, it is easy to attain 80 mph at part throttle. After the 800-mile mark was passed in our test, the engine began to run much smoother. Vibration was never really bad and it became negligible. (We'll be back to reporting vibration levels in numerical terms, as measured by our electronic equipment, just as soon as we perfect a simpler way of expressing the results.) Vibration control in the CB200 is obtained by mounting the engine rigidly to the frame and live-mounting the parts which touch the rider. The handlebars, footrests, seat, and tank are all isolated from the frame by rubber cushions. Both method and materials in these mounts appear to be identical those from the CB175. The frame on the CB200 is the same as the CB175. It is comprised of a pair of pressings welded together to form a backbone which runs along the top of the bike from the steering head to the rear of the seat. A single down-tube connects the steering head to the front of the engine and then joins a double-tube cradle which goes back under the engine and sweeps up to join the backbone pressing at the top rear shock absorber mount. A simple U-section channel is welded between the backbone, the swingarm pivot, and the cradle tubes below the rear of the engine. The resulting frame is structurally very stiff and quite heavy. But all that mass is the main reason why the little bike is so smooth. The only obvious change on the whole frame was to substitute a tubular loop for the pressing which doubled as a mount for the muffler and passenger footrest. We think that the purpose for the substitution was wholly cosmetic: they just wanted to make that part of the visible frame have a cleaner, more "tubey" appearance. Another more major styling modification gave the fuel tank a square cornered, boxey look and placed chrome trim strips along its midriff. The color on our bike's tank and side covers was a bright metallic lime green. A black painted side panel on the tank matches a molded plastic pad on the top of the tank. The effect of these shape and color departures comes off as being harder, much more Teutonic than any previous Honda. Both the strongest and weakest points of the CB200 are immediately revealed during a brisk ride down a twisty and not-too-smooth country road. Even with the rear shocks jacked up to their highest pre-load position, the first bumpy sweeper will have the rear end of the bike oscillating with such ferocity that the rider immediately forgoes any further cornering experimentation. One can't begin to examine the effects of frame rigidity and steering geometry when the bike's shocks provide so little rebound damping. It was the same with the CB360G that we tested last month. They both lurched around like '49 Buicks. Then when a tight corner comes up, there comes into play the best thing that's happened to lightweight street bikes: Honda's new mechanical disc front brake. The disc is a stainless steel pressing 10.25 inches in diameter and 3/16 inch thick. Eight large holes in the mounting dish of the disc reduce weight and give the front end of the bike a very racey look. The caliper looks like any other Honda caliper except that it has a cable housing entering its body instead of the familiar hydraulic hose. Inside the caliper is the most elaborate mechanical disc clamping mechanism we've ever seen on any kind of machine. The radial force of the cable lever is translated into lateral force against the friction pucks by the same type ball-bearing and ramp device as in the clutch throw-out. In order to provide smooth operation, a set of radially caged roller bearings apply relatively frictionless thrust to the caliper body opposite the movable puck. Yet another set of components, involving a screw in the center of the actuator and a nylon displacement sensor, automatically adjust the amount of puck retraction as the friction material wears. The device is simple and marvelously effective. Brake feel, in terms of how sensitively the rider can determine tire-to-road traction and thus know how hard to squeeze the lever, is absolutely the best there is in the lightweight motorcycle field. In our instrumented braking test, the CB200 could repeatably be stopped in 139 feet from a true 58 mph. Straight-road stability of the Honda is good. There is little tendency for the front wheel to follow seams in the road despite its narrow section. Stiff side winds and the turbulence from big trucks blow the CB200 around a moderate amount, but never far enough to be alarming. This is another instance where a curb weight of 300 pounds doesn't hurt. Steering response at slow speeds, like 20 mph in a residential side street, has a moderately heavy and very stable feel. The bike does not dart and flick from side to side from light inputs at the handlebars and footrests. One of our staff members lives at the end of a narrow and horrendously rutted dirt lane. The garbage man won't come up to the house anymore since he slid over against a fence and amputated one of his mirrors. The CB200 is the first small street bike that has felt stable enough on the loose dirt to be ridden one-handed down that drive while a full garbage pail is balanced on the left passenger footrest. As with most bikes, it is a relief to alternate one's feet between the normal and passenger footrests during long cruises. For this purpose the position of the passenger footrests was very good for our six-foot test rider. And that wonderful front brake kept him from feeling vulnerable with his feet back off the normal pegs. A new passenger grab-rail is now placed around the back of the seat for the occasional doubling-up need a CB200 owner may encounter. Because the CB200 holds thirty percent of its 2.4 gallons of fuel in reserve, the engine began to stutter with about 90 miles registering on the trip meter. Averaging 56 mpg gave us a range of 134 miles per tank. This mileage was obtained while running at wide open throttle much of the time. When we backed off to Pres. Nixon's suggested 50 mph cruising, the milage expanded to over 75 miles per gallon. That means 180 miles per tank. If gas goes up to more than a buck per gallon, as some suggest it may, the CB200 and its kind may become the most popular bikes on the market. 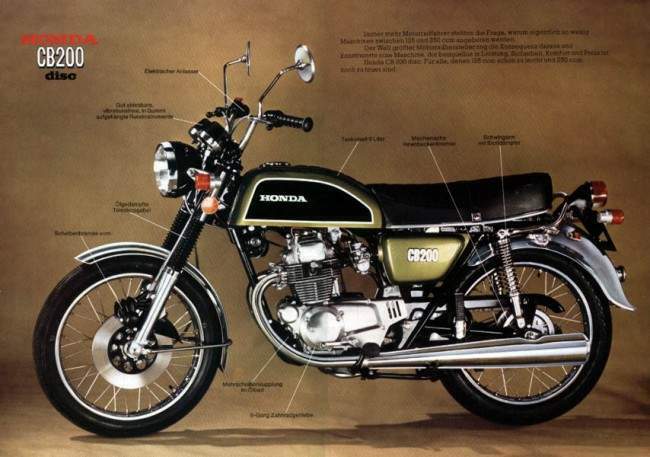 The CB200 is infinitely more simple and inexpensive to tune and maintain than the bigger Hondas. Since the crankshaft arrangement has both pistons traveling up and down in unison, a single set of points serve both cylinders via a coil with two simultaneous-firing high tension leads. That means both spark plugs fire on the power stroke and on the exhaust stroke but that aspect is of no consequence. When the points are adjusted and timed to open at the correct crankshaft angle for the left cylinder, the right cylinder is also automatically timed. That means half the parts and half the labor in the most time consuming part of a tune-up. The rocker arm/valve clearance is set with screws and locknuts at the end of each of the four valves. And the adjuster screws do not turn as you tighten the lock-nuts to spoil the adjustment. All the rider needs, other than a 10mm box wrench and a pair of pliers, is a couple of feeler gauge leaves. Both the independently-mounted air cleaners are right under their respective plastic sidecovers. Removing three bolts with a 10mm wrench and flipping off a finger clip allows the filter assemblies to be removed. The filters are made of a treated paper fiber permanently glued to the metal housing. The elements can be cleaned, after a fashion, by tapping the metal housing on the pavement to loosen the dirt and then inserting a compressed air hose nozzle inside the element and blowing the dirt away. The elements are very susceptible to tearing and clogging from running the bike in a damp climate. And when a new element is needed, you have to buy the whole assembly. A more practical filter element for the owner who does his own service would be one made from the urethane foam material found on Honda's dirt bikes. It can be washed in solvent, dried, re-oiled, and replaced many times before an inexpensive replacement is needed. At least the filters are easy to get on and off. The CB360G we tested last month had a connecting pipe between the two filters that was maddening to reconnect. Changing the oil is as easy as on any bike we know. The drain plug on the bottom of the engine is removed from the bottom of the crankcase with a 19mm or 3/4-inch wrench, the oil drained, the plug replaced, and two fresh quarts poured in through the finger-screw plug in the front of the primary drive cover. About every fourth oil change, the primary drive cover should be removed and the centrifugal oil filter washed out while the oil is drained. A larger rear chain (5/8 x 1/4 inch) is fitted to the CB200 and it requires less frequent oiling and adjustment than • did the CB175. We oiled the chain with Chain Life every 300 miles and only had to adjust it twice in 800 miles. The chain is easily adjusted with the tools in the standard tool kit. All the other maintenance items like changing the fork oil, topping up the distilled water in the battery and adjusting the carburetors are simple. We did notice that the power cable from the solenoid to the starter passed very near the battery case. The case was worn about half through from the cable vibrating against it when we discovered it happening at about 300 miles. Many of the proven features of the older engines have been bequeathed to the 200, albeit modified a bit to fulfill some new need or economic dictate. The centrifugal oil cleaner, largely responsible for the longevity of Honda engines, remains along with the somewhat outdated plunger-type oil pump. Only the access cover to the filter is absent and the primary drive cover must be removed to clean the filter. An altered form of the spur gear (straight-cut) primary drive is fitted to the 200. In the older bikes, the gears were in two pieces and the teeth on the halves were staggered to remove vibration and whine. The new one-piece gears are made of sintered (fused powder) metal and treated with a low temperature hardening process known as LCN io-nitriding. The impetus for developing the process was tougher pollution control laws in Japan which took a dim view of the fuming hot cyanide vats used to treat the old gears. As it turns out the new process is cheaper, safer, and produces better gears that are only fractionally noisier than the old ones. The gearbox shafts are still pressure-fed from the oil pump so that the gears will last as long as the rest of the engine. And the alternator output capacity has been raised from 80 to 97 watts at 5000 rpm to extend battery life. In comparing the CB200 to the automotive field, we would have to pick the Porsche 914. Like the 914, it is relatively expensive, has great brakes and just dreadful rear shocks. Its styling is distinctly "rounded-brick" and things are a bit cramped for large people. But, very unlike the 914, the CB200 is devoid of exotic (read expensive to service) quagmires like electronic fuel injection. The CB200 is the smallest bike that can be safely (and legally in many locations) ridden on freeways. And as the energy and pollution problems worsen, the CB200 may become the bike of the year.